We have loved hosting the site specific installation “BURST” by Andi Steele. Not only is it experiential and invasive, it also has that handmade quality that the artist cherishes from her experience at Penland (she was here on a ladder for three days tying individual knots with help from Gallery staff). The most interesting thing about “BURST” is that it’s hard to see from outside the gallery. Sometimes people will come in and say “where’s the art?”… then we show them that they are already standing in a site-specific installation. As they begin to walk through it, they feel like they are discovering something very special for the first time. For those of you that won’t be able to see it, we wanted to share with you what it looks like to interact with the piece. A few days ago, we took pictures of our Gallery Facilitator as she walked through it. Click through the thumbnail gallery below! If you are near the Gaston County Museum of Art and History, we recommend you see work by printmaking faculty Nancy Neives. 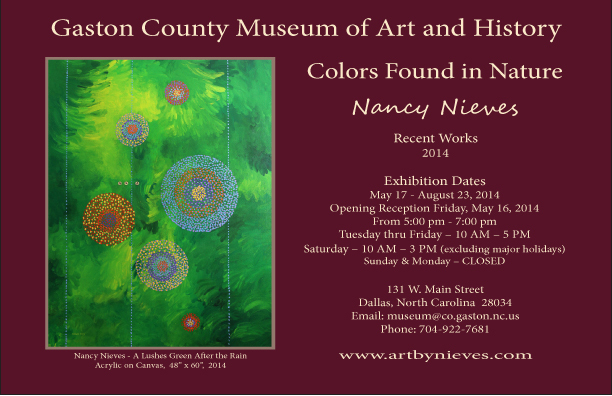 Her beautiful paintings will be on view in “Colors Found in Nature” through August 23.